Ms.Connie’s class would like to wish you all this week a “Happy Harvest Day” on October 31, 2018! Our class is so excited that we get to celebrate this special time of year with a Harvest Parade and class party. We will get to dress up in funny costumes and parade around our school campus for our teachers, family, and friends to see us in our attire. Then we will have a party in our classroom with fun treats, music for dancing, and we will share a funny story with each other. We have some great plans for the day! 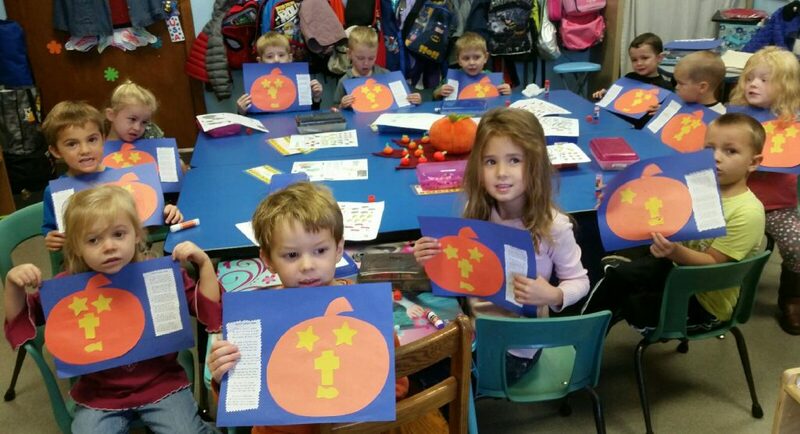 This past week our class made a special decoration during art time – a construction paper “Jack o Lantern”. This Jack o Lantern had special shapes that would tell others about God’s Love. We used star shapes for eyes, a cross shape for a nose, and a fish shape for a mouth. Included in this blog post you will get to read the “Jack O Lantern Poem” that we glued beside our “Jack O Lanterns on the construction paper. Each day in our class we try to pray that we will be able to tell others about Jesus and what God’ love is all about. Our class is so happy we get to share God’s love with you with our special “Jack O Lanterns” and poem. Carla's Class Veteran's Day Preparations!